As part of a recent visit to campus, Ambassador Puri, center, met with Model UN student-delegates at the Maxwell School. A cohort of University students will be representing India at the National Model United Nations (NMUN) conference, which kicks off on Friday, Oct. 30, in Washington, D.C. In preparation for the competition, students had the chance to meet with Manjeev Singh Puri, Indian Ambassador to the European Union. 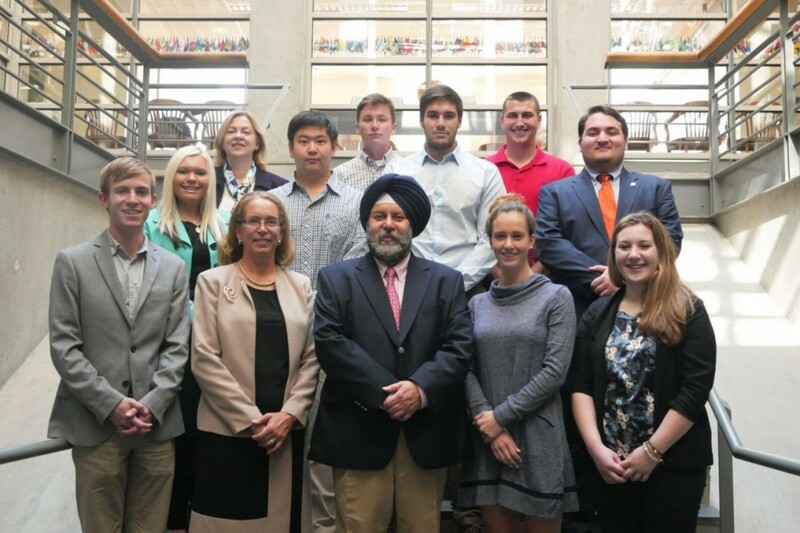 As part of his recent visit to campus, Puri met with student-delegates to discuss their role in developing position papers relating to the government of India. Puri spoke on the topic of multilateralism, which involves multiple countries working together on a single issue. It speaks to the heart of the work done by Puri, who has served in a leadership role representing India at the table during policy discussions on sustainability, climate change and the global economy. Prior to his appointment as ambassador to the European Union, Puri was India’s ambassador to the United Nations. His message was also valuable for NMUN student-delegates. In all, nine students majoring in international relations (IR) will represent the Republic of India in a simulation of global diplomacy. They are among 850 college students from around the world taking part in the annual event. According to Francine D’Amico, associate professor in IR and advisor to the Model UN team, the students are currently researching India’s policy positions on the topics before their respective committees to draft position papers to submit to the conference organizers. Once at the conference, the delegates caucus, negotiate and draft working papers to be voted on as formal resolutions urging UN member states and the UN system to take action on the issues before the committee. The National Model United Nations conference takes place from Oct. 30 to Nov. 1. More information is available here.